Deliver precise constant voltage stimuli. The DS2A Mk.II provides a precise Constant Voltage stimulus (up to 100V) controllable in Pulse Duration and Amplitude from self-contained batteries, making it ideally suited to electrophysiological recording in small preparations or cells where low noise is required. 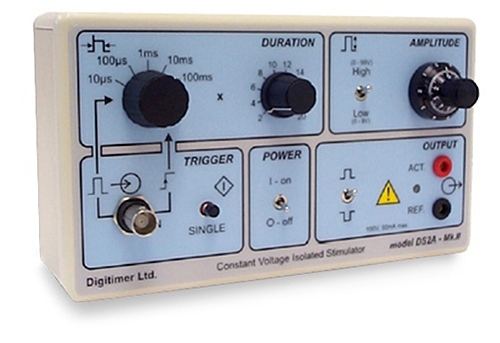 The DS2A can be triggered by an external device such as our new DG2A Train/Delay Generator. External control of pulse duration. Overload protection circuit preventing current in excess of 50mA being delivered.